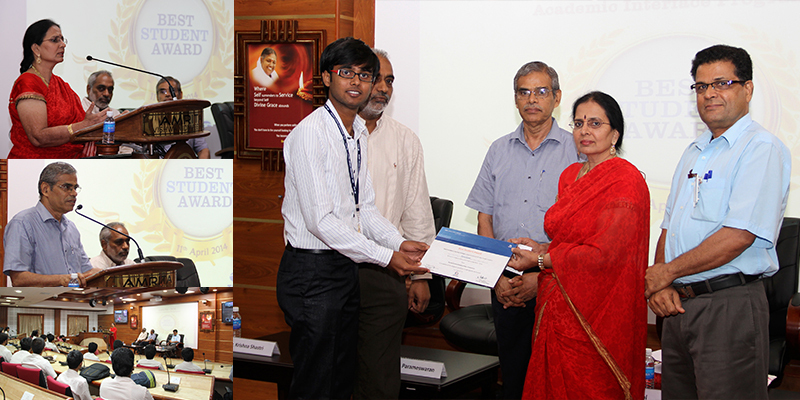 Rahul Goyal, the final year student of Amrita Vishwa Vidyapeetham from the Department of Information Technology, was the winner of the coveted TCS Best Student award for the year 2014. List of nominees comprised contenders from Aerospace, Chemical, Civil, CSE, ECE, EEE, EIE and Mechanical engineering disciplines. Despite the stiff competition, Rahul with his consistently good academic grades of 9.55 CGPA, managed to get the coveted award. The winning criteria was not just confined to academic performance, but also included parameters such as participation in technical forums, contribution to the department and the institution as well as other achievements. He had managed to excel in co-curricular and extra-curricular activities by scoring the top rank at CISCO CCNA NET-RIDERS competition, representing the university in Onsite ACM International Collegiate Programming Contest (ICPC), winning the 1st prize in the intra-university Web Designing contest, and being part of various organizing committees and events of IEEE and CSI. The award, presented by Ms. Hema Gopal, Vice President, TCS and Prof. C. Parameswaran, Director, CIR, Amrita University included a cheque for Rs. 10,000/=, a medal and certificates from TCS and CIR. In his acceptance speech, Rahul thanked his parents, teachers, friends, department, the university and TCS for the award. In his talk, Prof. Parameswaran underscored the long-standing relationship of TCS with Amrita. He traced the association to the MoU for instituting a chair professorship in German language, followed by the TCS-Amrita Sangam in 2006, and finally to the present day Academic Interface Programme envisaging the best student award, best student project award, FDPs, student workshops and internships. He also spoke about TCS as a favourite company in the campus and the research scholar programme. Prof. Parameswaran said that the Amrita was keen in furthering its relationship with TCS in future. Speaking on the occasion, Ms. Hema Gopal said that her organisation was proud to be associated with Amrita mainly “because of the kind of students this great institution produces”. She went on to say that “this institution has produced the best people who are working with the greatest quality and commitment with most of the customers”. Recounting her amazing experience where she had herself witnessed how an Amrita student placed at TCS, worked incessantly for three months on 160,000 lines of COBOL code for an international Banking client, she reasserted how “this institution has produced such world class professionals who are actually doing things in a transformational way”. She urged all students to take the cue and move ahead and demonstrate their “willingness to be exposed to challenging tasks”, the “willingness to be adaptable and flexible”, and “putting all sincere efforts” in “doing the job that is given” rather than “choosing what you want to do”. She appreciated the efforts of Amrita in getting the best of the talented professors from IITs, and said that this showed their commitment to create an intellectual capital to make India a superpower. Redefining IT as “Indian Talent”, Ms. Hema Gopal described how TCS had grown from 1200 people in 1985 to over 3,00,000 people today, with the help of academic institutions like Amrita that have continuously given quality people to make it bigger and bigger. Saying that “Gratitude defines altitude”, she advised students to remain human and humble. Prof. K. Gangadharan, Chairperson, IT Department, shared his thoughts on how year after year TCS had continued to motivate and inspire students through this award. He encouraged the junior batch students to strive hard. Mr. Krishna Shastri, Joint Director, CIR, gave the welcome address as well as briefed the audience about the nominees for the award and the selection process. The vote of thanks was proposed by R. Krishnan.